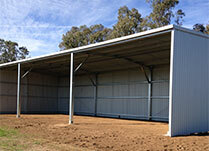 Ezyframe sheds have been Established for over 30 years. 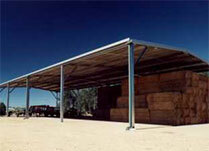 We are renowned for its quality standard and custom rural, commercial, and industrial sheds. 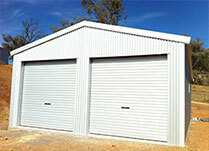 Ezyframe sheds is positioned to produce strong and robust sheds that offer excellent value for money. Ezyframe continues to set the “industry standard” in the ‘C’ Section range of buildings using bolted connections. Our range of back to back “C” sheds use 16mm cast-in “U” hold down bolts giving a strong connection. Ezyframe prides it self on a better built design which incorporates cast in footing bolts and fully bolted connections for all structural members. Combining a better designed building and our great customer service the choice is easy! 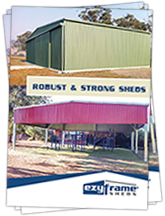 Ezyframe has been based in Quirindi for the last 20 years and in that time we have supplied over 2000 sheds in NSW. We can supply sheds in the eastern states of Australia and service areas like Tamworth, Gunnedah, Moree and most areas in northern NSW. We have a quality after sales service to insure that you can find all the services in your area to get your building constructed and ready to use. 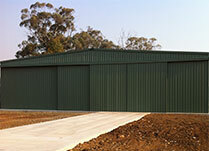 Talk to us today and get new ideas about how we can help you with the design of you new shed. 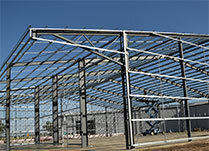 We are happy to guide you through the whole process from quoting through to the finished building. Talk to us today about our large openings and clear span buildings that can give you great access for your tractors and larger implements. We have supplied 12m openings to many customers to allow headers to access without having to remove the combs.